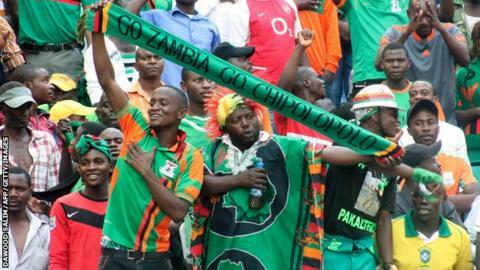 Zambia secured all three points against Algeria with a 3-1 victory in front of their home fans. A Brian Mwila brace helped Zambia keep their 2018 World Cup qualification dream alive with a 3-1 win over Algeria on Saturday, leaving the Desert Foxes' hopes of reaching Russia in tatters. The result in Lusaka moves Zambia up to second in Group B after three matches, five points behind leaders Nigeria. Algeria - who were without playmaker Riyad Mahrez - are bottom of the standings on just one point. Elsewhere, Ivory Coast won 3-0 in Gabon and Senegal and Burkina Faso drew 0-0. Zambia's Brian Mwila scored the first of his two goals against Algeria from a powerful header off a well-placed Augustine Mulenga cross in the sixth minute. Mwila added a second after 32 minutes, this time with a close-range shot after Algerian goalkeeper and captain, Rais Mbolhi, failed to keep hold of the ball. Algeria fought back in the second half and were rewarded with a goal from just outside the box by Yacine Brahimi in the 53rd minute. The Desert Foxes were given a further boost just three minutes later when Zambia's Fashion Sakala was sent off for a second yellow card. However, Algeria found it difficult to get the equaliser and two minutes from time, substitute Enock Mwepu scored Zambia's third to make it 3-1 to the hosts. The result all-but ends Algeria's hopes of qualifying for the 2018 World Cup in Russia, but keeps Zambia's slim hopes alive. The two teams will meet again in Constantine on Tuesday. In Libreville, Ivory Coast were 3-0 winners over Gabon to go top of Group C, two points above Morocco who thrashed Mali 6-0 on Friday. Seydou Doumbia - currently on loan at Sporting in Portugal from Roma - then struck twice in six minutes to give the Elephants the win. Both his goals were supplied by Gervinho, the first coming on 77 minutes when he lifted the ball over Gabon's goalkeeper. Ivory Coast have not lost in World Cup qualifying for 26 games - a run that has been going for 12 years. Burkina Faso are top of Group D with five points after they held Senegal to a 0-0 draw in Dakar. On a disappointing night for the hosts, Kalidou Koulibaly was sent off in the 84th minute for a second yellow card. The two teams will face each other in their fourth game of the group phase in Ouagadougou on Tuesday. Senegal are second in Group D, a point behind Burkina Faso and level on points with South Africa who lost 2-1 to Cape Verde on Friday. Cape Verde are bottom, only two points off the top, in what is now one of the tightest groups in qualifying.